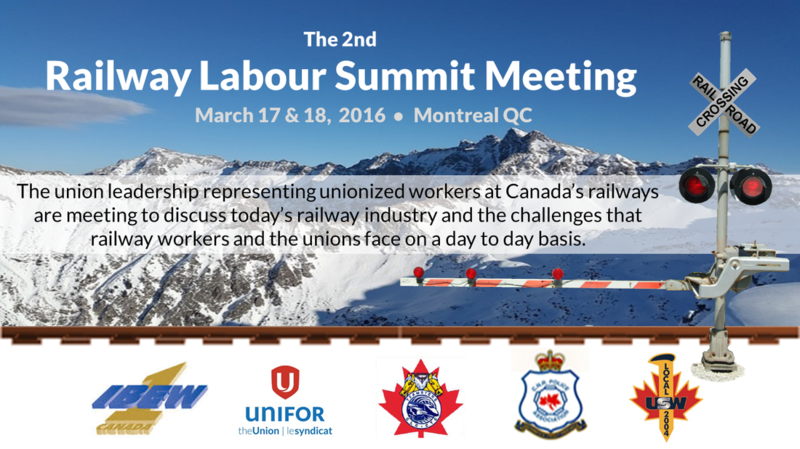 ​The second Railway Labour Summit Meeting is scheduled for March 17 and 18, 2016 in Montreal. The first meetings were held on February 19 and 20, 2014. The union leadership representing unionized workers at Canada’s railways – Unifor, United Steel Workers (USW), International Brotherhood of Electrical Workers (IBEW), Teamsters Canada Rail Conference (TCRC) and the CNR Police Association (CNRPA) – are meeting to discuss today’s railway industry and the challenges that railway workers and the unions face on a day to day basis. A summary of the meeting will be made available a short time following its conclusion.